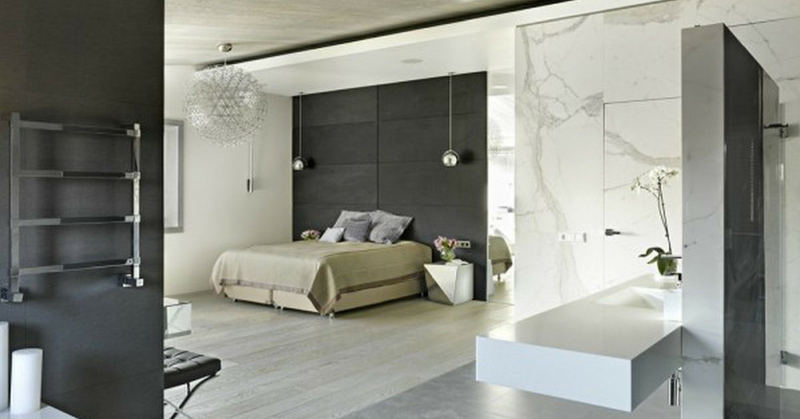 Delicate Clean Artistry in Modern Contemporary by Fedorova Studio. Featuring clean lines, dense hues, wooden elements, and delicate floaty furniture, this house focuses on the graceful challenges of tuning each furnishing into its finest. Like most homes nowadays, this one also incorporates an open floor plan to give you full view of the dining, living, and kitchen. This also allows you free reign of roaming around the house while keeping your presence available to other inhabitants. Wide, tall doors that reach from the floor to the ceiling blend harmoniously together, projecting a lavish and generous amount of space to meander about. With a minimalistic goal in mind, the designers set off redefining the norm by strategically embedding intricate and decorative hangings and furnishings that deliver a specific illusion. As pictured, it is an interesting use of space as everything is equally distributed despite the number of decorations being kept at a minimum. The appearance of a refreshing calm among the greyness and wooden elements play a prominent role throughout the house, with simple but exclusive pieces to complement well with the surroundings. Toned for a relaxed and calm ambience with a little mix of fun and engaging illusionary components, this truly is a home for the modern human being.